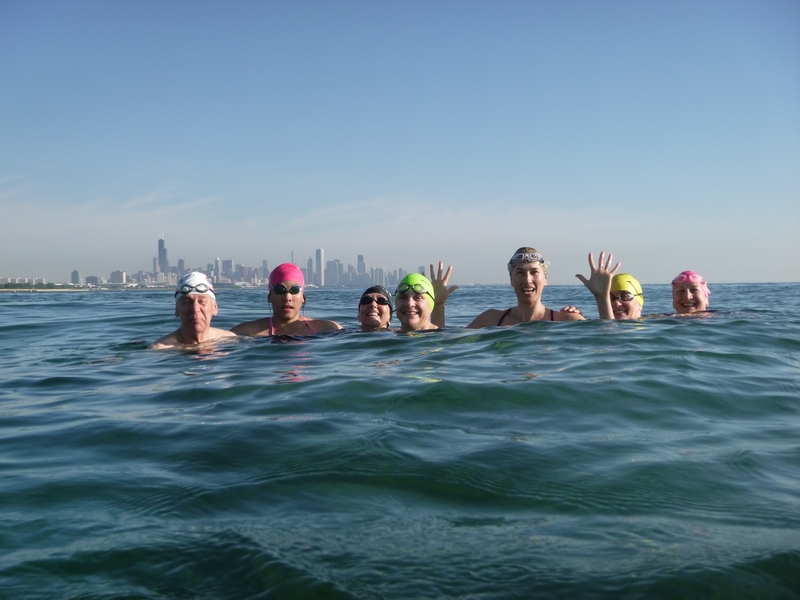 This past Saturday, I had the privilege of swimming with the Point Swimmers in Lake Michigan. The story of how I found myself there is the primary reason I love the open water swimming community! I had to be in Chicago for work last week. Hoping to find a place to swim – I reached out to Evan Morrison (since he used to train in Chicago) to see if he could provide any guidance. He told me about a group that swims at Promontory Point most days. 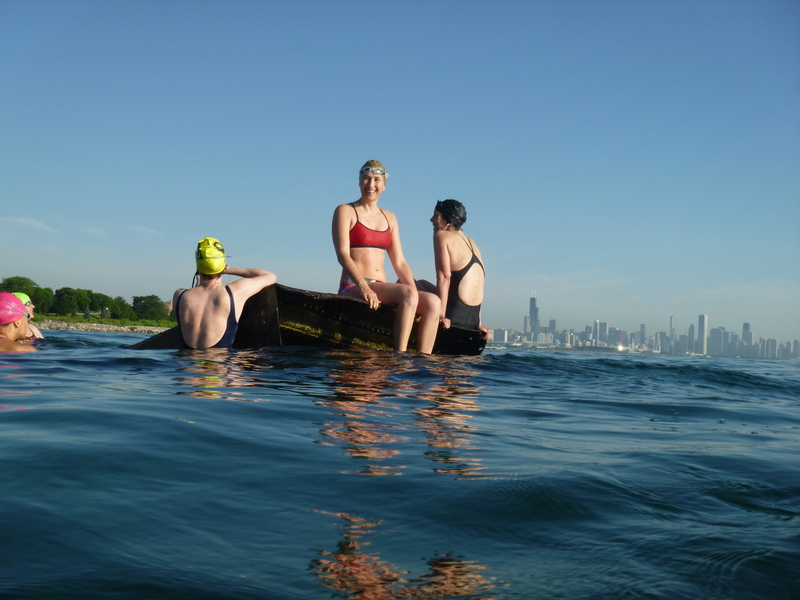 So, I googled Promontory Point Swimmers and found my way to the Point Swimmers Facebook page. I sent a message to Louise LeBourgeois who appeared to be active on the group’s page. I explained my situation and asked for any guidance she could provide. She emailed me back within 15 minutes and invited me to swim with the group on Saturday morning. Not only did she invite me to swim – she also invited me to the after-swim birthday party for two of the swimmers in the group. It was to be brunch at one of the swimmer’s apartments. 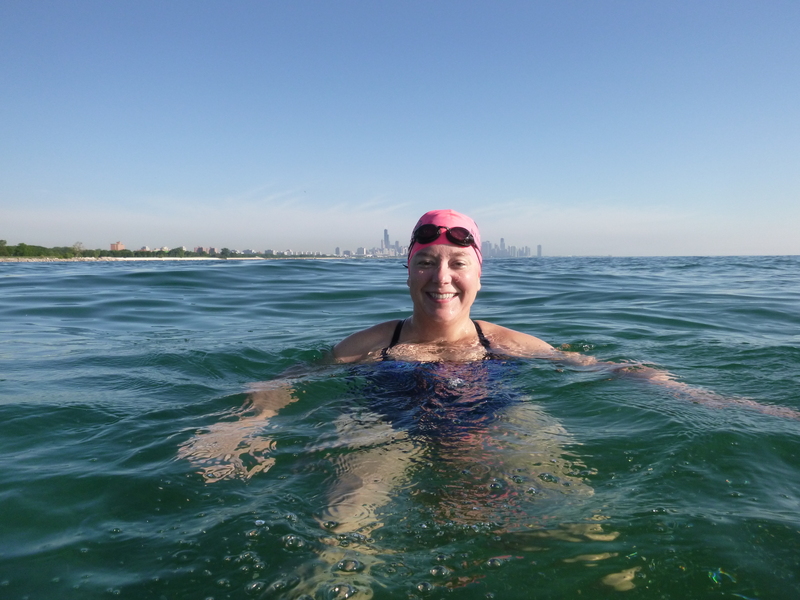 She also explained that they were planning to swim at a different place on Saturday to explore a ship wreck just off of the shore and a shoal that extends out into Lake Michigan. WOW!! Yes, a thousand times…yes! Louise and I exchanged contact information and she told me where to meet them. So, on Saturday morning I got a taxi at 6:30 and headed down to the meeting place near Hyde Park. I had a difficult time locating the pedestrian bridge – so I called Louise. Her dad answered and said they were nearly to my location – so they would pick me up. They pulled up a few minutes later and I hopped into Louise’s car and met her, her dad and another friendly swimmer person – Alison. We found a place to park and headed to the beach! 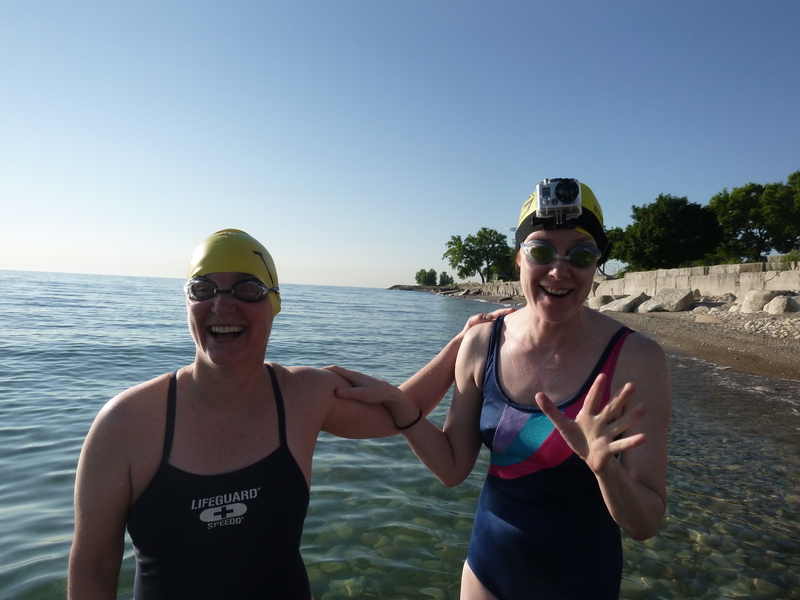 There were about 10-15 people out that morning – young and old, fast and slow – but all friendly, welcoming, interesting and passionate about swimming in beautiful Lake Michigan. It was a warm, clear day – not a cloud in the sky. The lake is clear – so clear as you can see from the pictures that we could see the shoal beneath us. We waded into the cool, clear water and swam out to the ship wreck. The primary piece jutting out above the water is a boiler from a ship that ran aground on the Morgan Shoal on July 18, 1914. The ship was the Silver Spray – 109 foot long wooden steamship that was built in 1894. The boiler was fascinating and the group explored it from above and below. Then, some of us headed out to swim along the shoal. The Morgan Shoal is a 300 million year old limestone structure. 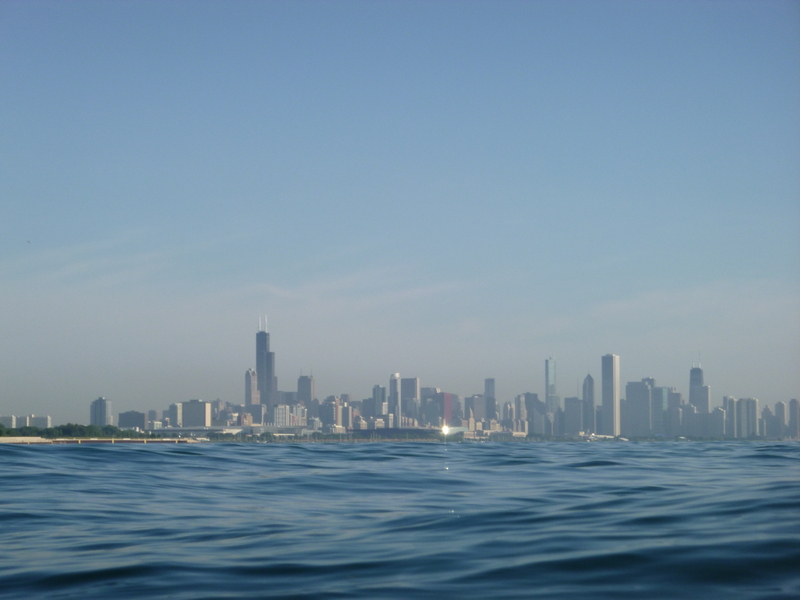 It is the closest shoal to the Chicago shoreline and extends out into the lake about a ½ mile. The depth is as shallow as 3-4 feet and as deep as about 8-12. This rocky shoal is a bit different from the rest of the lake – which is primarily sandy bottom. We saw little fish swimming among the nooks and crannies of the shoal – and even a few larger fish. We paused for pictures and had lots of laughs along the way out and back. We finished our swim and headed to brunch. The food was amazing and the company outstanding! I met some swimmers who were not able to be at the lake that morning – and got to spend some more time with the people whom I’d met during the swim. It was truly a lovely way to spend a Saturday morning in Chicago. Louise was nice enough to drive me back to the hotel (after a short stop at local Farmer’s Market). We said our goodbyes and as I walked away from her car I vowed to come back as soon as I could. The people are amazing and the lake is beautiful – what more could an open water swimmer ask for! So, now that I have learned that next July will be the 100 year anniversary of the sinking of the Silver Spray – seems appropriate to head back there (at least by then) to celebrate a pretty cool anniversary with some amazing new friends! Thanks to all the Point Swimmers for making me feel so welcome and for sharing your lovely lake with me. This entry was posted in Training, Uncategorized. Bookmark the permalink. Thanks for putting that together! Nice pictures of the group too! Hi Evan. Thanks for sending us Courtney. We had a great swim out to the ship wreck on Saturday. and an epic birthday brunch at Grace’s…which if I’m not mistaken is how we all met you, and where you met Ted 3 long years ago. We miss you too, Evan! Thanks for being such a great link for all of us to the wider community of open water swimmers. We loved meeting Courtney, and we’d be happy to welcome anyone else you send our way. It was so super to have you join our little mermaid coven on Saturday, Courtney. Great picts – thanks for sharing!